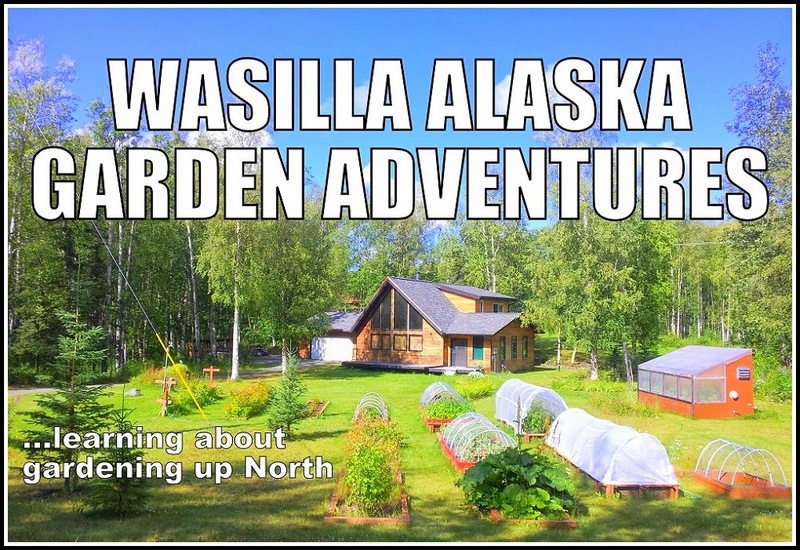 Wasilla Alaska Garden Adventures - learning about gardening up north. 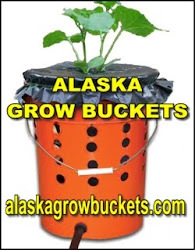 ANOUNCING - Complete DIY Alaska Grow Buckets Kits are NOW available in time for Spring planting on my Alaska Grow Buckets Website ! *Sales are limited to U.S. and Canada only at this time. Here is the latest update on my Alaska Grow Bucket System. All of this year's tomato plants seem to be doing as well as ever just 4 weeks after transplanting into the improved Alaska Grow Bucket System. My new fertilizer seems to be promoting blooming over foliage growth. At least I am not getting the large bushy plants I had last year. This year I am trying Jobes Organics Vegetable & Tomato fertilizer this is listed as a 2-7-4 plant food made from bone meal, chicken feather meal, and composted chicken manure with additional beneficial bacteria and fungi including mycorrhizae. I also cut back on the total number of plants to allow more space and hopefully improved ventilation and humidity control. I have also tried to be more vigilant in pinching off unwanted sucker growth. 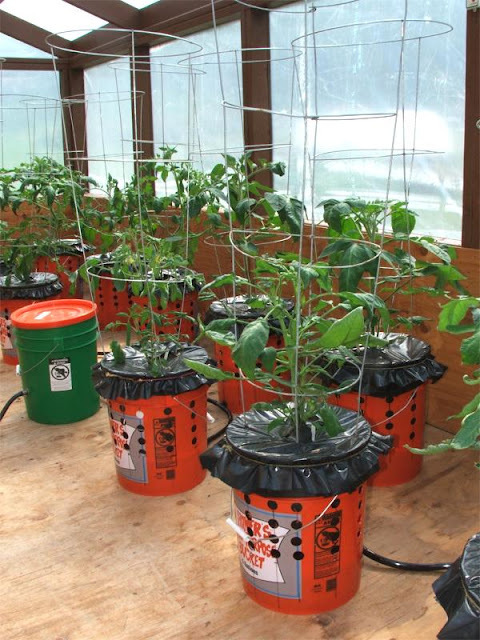 All of the Grow Buckets are connected by a single gravity feed 1/2" flexible vinyl tube that is fed by a float valve regulator in the green bucket with the orange lid in the upper right corner of this photo. 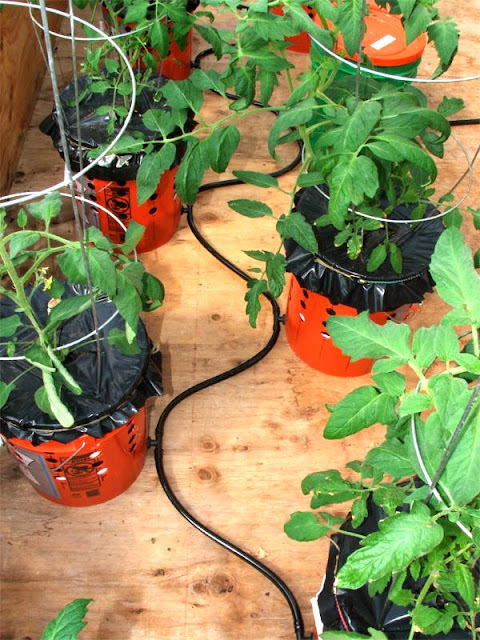 This maintains a constant self-watering irrigation system that requires no electricity. The Float Valve Regulator in the green bucket is connected to a 35 gallon gravity feed reservoir made from an inexpensive plastic trash container. At this point in the season I simply refill the bulk reservoir about every 2 weeks. As the plants continue to grow the water needs will increase and the refilling frequency will also increase. The beauty of this system is that the peat based growing medium will absorb the correct amount of water to remain moist. So the system is self regulating - as long as the water supply does not run dry. A simple visual check every few days is all that it takes. Another advantage of any Sub Irrigated Planter (SIP) system, for those gardeners that live in arid climates with limited water resources, is that by covering the Grow Buckets and keeping the reservoir covered you will greatly reduce water loss through evaporation. This is another problem that occurs with traditional planting methods and above ground irrigation. Water savings can be substantial. Here is an overview of the entire improved Alaska Grow Bucket - Sub Irrigated Planter (SIP) System. From The Bulk Reservoir, to the Float Valve Regulator, to the easy to make Alaska Grow Buckets. It works great for tomatoes, but works equally well for peppers, eggplant, cucumbers, and many other vegetables. I believe it is the easiest system that anybody can use to grow their own food at home - on a terrace or balcony, a porch or patio, or in a backyard greenhouse. Get your Free DIY plans HERE. Looks like a good system. I think I'll try it. Interesting setup, and I have an idea you may want to consider - after reading through some of your entries, you mention the problem with the temps dropping at night. This is a common problem with greenhouses, and it has to do with thermal mass. A common trick to increase thermal mass is to use water drums, painted black to absorb heat, and line the back wall of the green house. During the day they'll absorb heat, and at night they'll radiate it. This is because Water has 4 times the specific heat capacity of Air. Seeing as how you've already started black garbage cans, adding more, even a second line on a rack above the first(connected to the bottom layer via a float valve), will greatly reduce huge temp swings. In our greenhouse we use for winter growing (lettuce, mizuna, mangold, broccoli, etc) tents from microten (? PE?) folie , that covered beds from frost - our greenhouse is not heated visited in winter cca 2x in month. We live in Prague (Czech rep., Europe) in winter is sometimes to -20 to -25 grad of Celsius. I haven't had any problems with water stagnation. Add a small amount of microbial tea. Put an airstone in it from an aquarium. I don't used an air stone - I am trying to avoid electric power for pumps or fans. I have one solar powered greenhouse fan for ventilation. So this is a hydroponic system then, correct? No it is not a true Hydroponic system - it uses a peat based growing mix. but wouldn't anything, that does not use earth as a medium, be considered hydroponic? Very cool idea, wondering what the role the colander plays? I'm not sure if I missed something, but I would like to know the soil you used and then if that's plastic on top? Does it get moldy? This looks very interesting, have you tried it with any other hot weather crops? I am thinking peppers or melons? This also looks like the earthbox system that I have been using for about 10 years. It works great!!! I'd love to see the inner workings of your green bucket. thanks for sharing your life and talents with us, all the best to you and yours in AK! Look up urine as tomato fertilizer, sounds like just the thing for your purpose. This is great info, this has helped me resolve the challenge I have with keeping my plants watered, while away on business trips of 3 days and longer. I love this! It really seems like a great idea and easy system to follow. I am wondering if it could be hooked to aquaponics as well - maybe a holding tank for the dirty water if it couldn't be sent directly around the system? could I use a burlap or muslin sack instead of the fabric shopping bag? the sources for some of those bags are shady and many test high positive for lead and other toxic substances. Are that holes in the buckets? Great post. I'm a new follower. My name is Laurrie and I write the Baked Lava blog at www.bakedlava.com. I am an avid container gardener and a full-time RVer who lives in SW Washington state. I'll be following your blog with great interest as I'm amassing heirloom tomatoes to grow from seed this summer. I have 33 varieties so far with more on the way. My set up is a bit different, I don't do the self water thing, but this is one of the coolest tomato growing gigs that I've ever seen. I am mostly a food blogger, but I also post about my garden. Great blog and I'm glad I found you! What about digging a walipinni green house dug into the ground except the roof you would stay warmer when the cooler weather starts to move in. Unless your sitting on rocks then that wouldn't work. Thinking out loud here... I suppose one could use plastic tubs as well.. thereby increasing the flat growing space for lettuces and other root vegetables. Food grade plastic buckets are cheap or free for the asking at bakeries, restaurants, etc.Also, I totally advocate a previous post about using a thermal water bank of garbage cans / black painted metal drums to help keep temps more stable in your greenhouse. The advantage of drums is that you can stack them Or use the plastic barrels that ilives,etc come in.Adding a stone floor or a brick floor that can absorb the heat also helps. I am curious as to the purpose of the colander as well.. Can you please explain. I did read the pdf but no mention of its use. The colander holds the bag off of the bottom of the bucket and allows the water to flow freely - otherwise the flow becomes blocked. I have seen some people use rocks - but the colander works best for me - I suggest that you experiment and send me your results. So with the peat you do not have to add any other hydroponic solution, just a fertilizer? How about as someone asked using it for aquaponics? Is your greenhouse only summer time use? Fish and game wont let us in AK farm fish but goldfish work. You can raise the fish but according to F&G would be fish farming if you ate them. WHY CAN'T YOU USE DIRT???? You need the peat because it will wick the water up to the plant. Dirt will not wick the water up and will clog the pores of the bag preventing oxygen from interacting with the roots. This is a great idea! Thanks for breaking it all down for easy understanding. My only suggestion is to switch to the white food grade buckets add the orange ones pictured can leech chemicals from the bucket plastic. Use whatever buckets you feel safe with. I would not feel safe using old buckets that contained toxic chemicals - but it is my understanding that leaching chemicals from non-food grade buckets used as vegetable growing containers has not been shown to be dangerous. I encourage people to recycle the many used buckets that just get thrown away all the time as long as they did not previously hold something highly toxic. Jim , I wouldn't be afraid to use kitty litter buckets. I use them to do water changes for fish so if something was wrong with them I would definitely know! Don't use anything that has had bleach, gasoline, oils, tar or anything flammable in it. I would also stick to plastic because metal corrodes. have you tried to grow other things also...like herbs, melons...or whatnot? do you think it would work? I had to have missed something. I went to download the free plans but could never find them. Even after I found the page the asks for a donation of 1.50 and then you could download the free plans, you wind up on a page that says you have to sign up for an 8.99 subscription to have access to it. I am already out the 1.50, don't feel like being surprised by a purchase of 8.99 and then still not being able to get the "free" download. I looked up the site got a pdf down load, printed it and was never asked to pay anything. I did find a place to donate. Have not donated yet as they don't have pay pal. So I'll call. I had given up on vegetable gardening after moving to Colorado 14 years ago. Every year I try results in dead plants. With this my tomatoes are 6 foot tall, the cucumbers and sweet peas are trellising well, and all are producing great. I used three gallon buckets I got for free from the grocery store bakery department. I have a single 5 gallon reservoir bucket fed from a garden hose and controlled by a swap cooler float valve. My grommets kept coming out when the bucket or hose were moved so I glued them and the hose connector in place. Next year I will use bulkhead connectors on buckets, a more flexible hose, and burlap bags. Can you reuse the medium soil year after year? 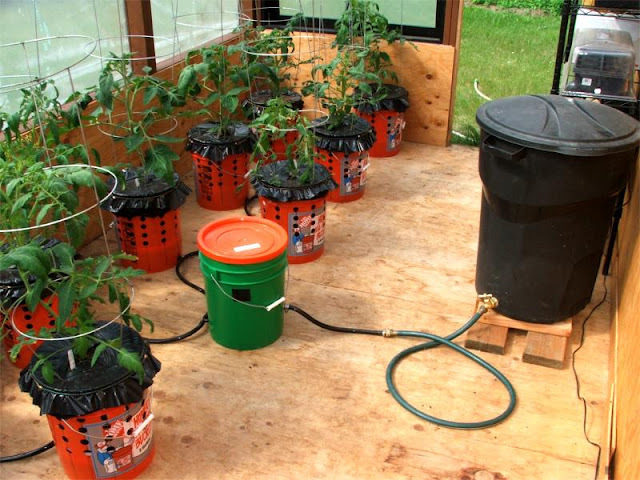 I'm about to set up a bucket system for tomatoes and will use a hydroponic system, that is, all water, no support medium as your peatmoss system uses. Reasons are: cheaper, less parts, less work, less mess. I have read they work without aeration of any kind and contra that they work "better" with some aeration which might be provided just by circulating the water 30 minutes per day. Why did you not select a pure water system? Hey Jim Love the setup. Going to build this for my daughter who lives in an apartment with limited patio space. I will add goldfish to the water tank to take care of nay mosquitos and also supply nutrients for the plants. I have a suggestion, you should have a Pay Pal option on your donation page. I would be glad to make a donation that way. I have two dogs and they have spent endless hours snurfing through the garden eating all the bits of poultry meal and feather meal that I fertilized with. It doesn't seem to cause any intestinal distress but I wonder how much goes to the plants? You have devised a great system and thanks for sharing. would it better for the col-lender to be upside down for more water?or is better the way it is so the soiless mix is sitting in some water? Sorry, Jim, don't pay attention of what I've wrote above. All the answers were right here. Great work! This seems like a nice system that works well. I had some questions..
1. What species of pollinators do you have, as it seems be off-season, in a greenhouse in Alaska. 2. Are the vent holes necessary or is there enough ventilation with the mesh bag and peat, or maybe just adding a spacer/stick/tube behind the bag and skipping the plastic sheet cap. Drilling the holes seems like it could take a while. 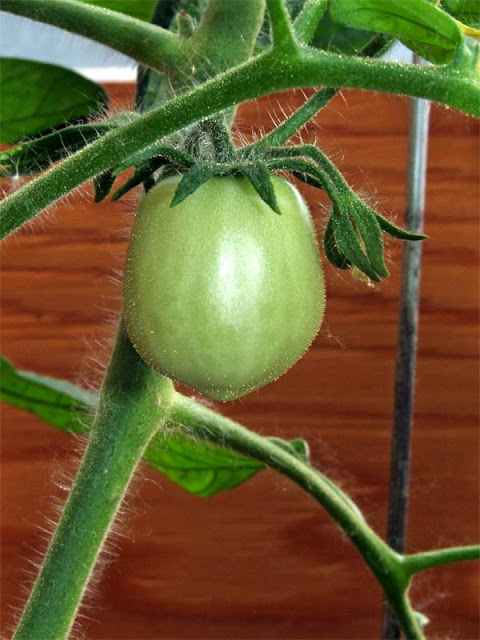 In order to double or more the yield vs time and cost invested, can I put more than one tomato or pepper plant per bucket? I put one tomato and one basil in each bucket. I think 2 main plants would be too much. I am greatly interested in this growing method. I live in Lemont (southwest suburb of Chicago). I am wondering if anyone from Illinois / Indiana has used this system outdoors (no green house) with success? I enjoy growing my own food, cooking what I grow, and planing next years garden. I moved to Alaska over 20 years ago and I have been successfully growing vegetables in my tiny 8x16 ft greenhouse here in Wasilla, Alaska using a unique system that I perfected over the past 10 years. 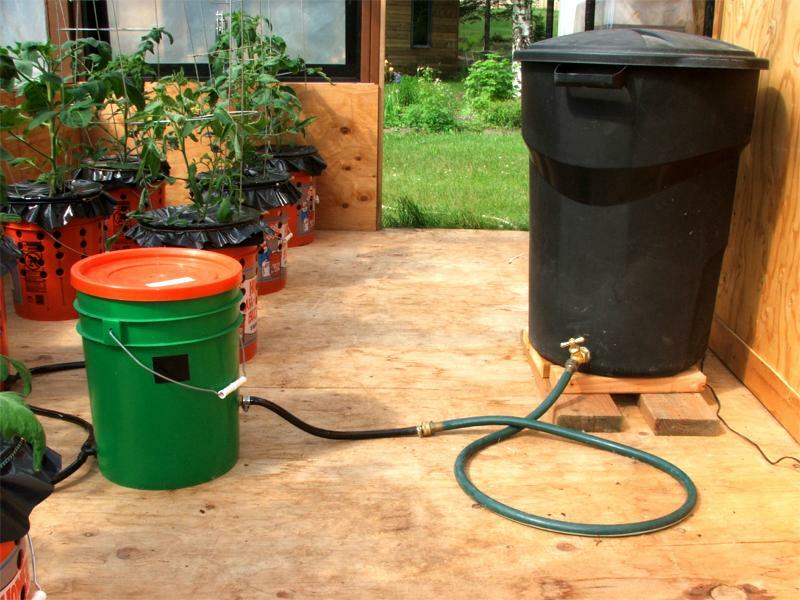 I call my simple system the Self-Watering Alaska Grow Buckets Garden System. I have been learning just what it takes to grow vegetables way up North yet my Alaska Grow Buckets can be used just about anywhere that you live. I want to give you the tools and show just how easy it can be to grow food on an apartment balcony, building rooftop, front porch, deck, patio, community garden plot, vacant lot or in a backyard greenhouse. As Norman Vaughan said, "Life is an adventure!"